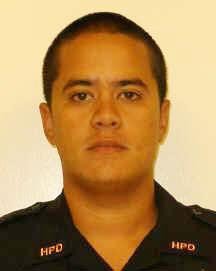 The Kona Crime Prevention Committee recognized Kona Patrol Officer Justin Gaspar as “Officer of the Month” for August in a luncheon ceremony on August 1 at Huggo’s restaurant in Kailua-Kona. Gaspar was honored for his role in the arrest of two convicted felons and the seizure of drugs, ammunition and drug money in their possession. 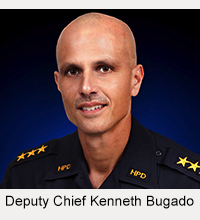 On May 31, Gaspar was patrolling the Kona Palisades subdivision when he observed a suspicious vehicle parked with two occupants. When he made contact with the two men, they acted defensive and suspicious. From previous contact, Gaspar recognized the men as individuals who used and sold crystal methamphetamine. He alerted Vice officers, who determined that they had crystal meth, prescription pills, ammunition and $580 in cash in their possession. Both men were arrested and charged with numerous drug and firearms-related offenses. Sergeant Akira Edmoundson, who nominated Gaspar for the award, noted that from January through May, Gaspar investigated 93 additional incidents, 19 traffic accidents and 123 miscellaneous public complaints. During that same time period, he arrested 57 adults and issued 175 traffic citations. 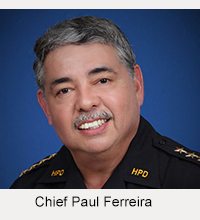 The Kona Crime Prevention Committee is an organization that encourages community involvement in aiding and supporting police in West Hawaiʻi.